Create any size workbench in less than an hour. If you want a workbench fast, and you want it to last, then this is the kit for you. Combined with only 2x4s and plywood, this kit allows you to create a workbench of any size that will last indefinitely-all in less than an hour. 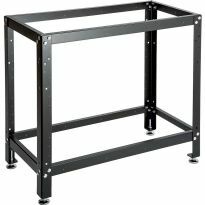 The sturdy resin legs have a greater strength-to-weight ratio than steel, and are specially engineered to combat racking forces and keep the assembly perfectly square. With a weight capacity of up to 1000 lbs. per shelf, it'll hardly break a sweat under as much weight as you can dish out. Use full 4' 8' sheets of plywood for a spacious assembly bench, or throw together a power tool stand as small as 2'x2'. It's the perfect solution for custom sizes, and incredibly easy to modify. No miters, no tricky cuts or joints - all you need is a drill and a saw! I assembled the workbench quickly. The posts made the project very easy. Easy to assemble - less than an hour. Sturdy and solid. 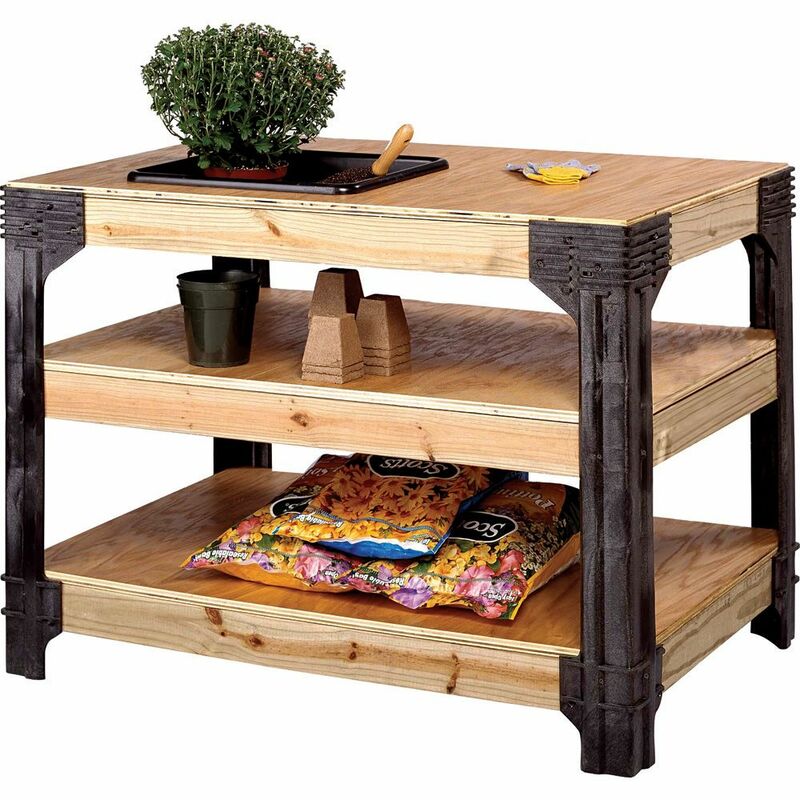 Used for outdoor planting work surface and storage. Highly recommend this kit. Very easy to put together by yourself. 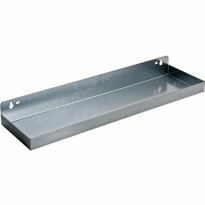 I even purchased some heavy duty casters to install at the base of my benches so the benches could be moved around easily if needed. The workbench was easy to put together and works very well. Very sturdy. Great idea. I needed a sturdy stand to hold two 35gal tanks to prepare salt water for my aquarium. Very easy to construct and very strong. 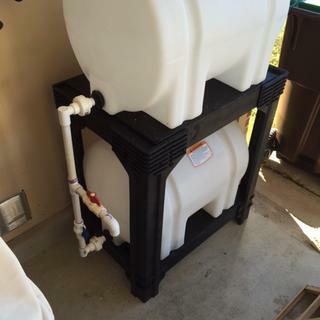 Storage tank stand for my salt water aquarium, sturdy and easy to use! Very strong and versatile. Strongly recommend. I put mine on 750 lb. rated wheels so I can move it around. A simple yet elegant design allows you to build a worktable to your own requirements. Very easy to do and the end product is outstanding. I am in the process of adding wood vises and looking forward to using this great workbench. It was simple to build a work table with this leg kit. Affordable and practable and you end up with a sturdy work area. I received the workbench leg kit in a very timely manner. It was very easy to assemble the supports and flat surfaces. The leg kit allowed me to have a great workbench at an afforded price. After about an hour I had a 2' x 4' very sturdy and stable bench for a drill press and sander. Couldn't be happier! I would buy again. garage. I used a better grade of plywood and select two by fours. I needed a place to work with and store what few tools & simple supplies I had. I didn't trust myself to build the legs/foundation of a bench so this looked like a great solution. Since then I have taken up woodworking and converted my bench to a full blown woodworking bench. My top is two layers of 3/4" MDF. I've added dog holes and a face vise (BTW I highly recommend Rockler's plastic bench dogs). My top layer overhangs the bench about two inches on three sides so that I have a nice lip for clamping. I also used MDF for the shelves. I like the MDF for the mass it provides. This makes a rock solid bench for hand planing. The versatility of these legs is unmatched. They are super strong too. Assembly is very intuitive. The manufacturer's website has lot's of great ideas for bench design. Like another reviewer I would have bought more for my bench top power tools if I could figure out a way to attach wheels and make the stand mobile. My shop is small. Miter saws, router table, etc need to be mobile. Try a set. You won't be disappointed. Bought four for a new workshop. Can make them any size. Easy instructions. Would buy another if the need arises. I bought a pair of these, one for me and one for my wife (a cloth cutting table). It was simplicity itself to put together with the top and bottom shelves. With 3/4 inch ply for both shelves they are nice and solid. I added a couple of cross braces on the big table but otherwise followed the instructions. They will make a major improvement in our ability to complete projects more easily. I used 2x4 braces across each shelf on 16'' centers, 2 for each shelf with joist hangers, also I put metal corner braces on each of the outside 2x4's for each shelf, over kill,of course it is, but this is one VERY SOLID work bench, I am 100% satisfied with this product. 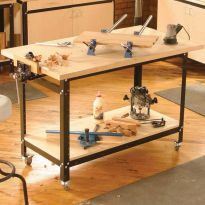 Contrary to another review I just read, this is a great workbench. If you use quality wood and follow the ridiculously easy instructions (without improvising0, you'll have a durable workbench. I'm not sure what the reviewer meant by ...only good for &quot;light&quot; work, but there's nothing light about the bench I just built. It's level, heavy, wobble-free, and As a serious hobbyist, I couldn't be happier. Reality Check: This is as solid as you CHOOSE it to be. 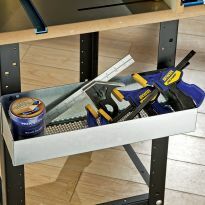 However, if you're a professional and not a hobbyist, know that this may not do the trick if it's your main workbench. Although I could make a strong argument otherwise, it's probably seen as only a great supplemental bench for a serious woodworker. This set of legs was nicely thought out and engineered. Of course my father and grandfather would be hyper-critical about it being made from plastic. (of course their workbenches were carved from the bases of redwood trees it would seem, since they weigh in at almost 1000 pounds!!) Easy assembly. All screws come with. Assembly instructions are limited but if you can't figure it out by the images on the box, then you probably shouldn't be working with sharp tools. I would suggest further cross bracing on the shelves. At least one additional on the lower and middle shelves, and I would add 3 to the top shelf as this will be seeing the most punishment. (And yes, don't go skipping a shelf on the bottom or middle just because &quot;you&quot; don't think it needs it or you don't want it. This is designed structurally to have all shelves present.) Nice simple shelving (workbench)solution at a fair price. 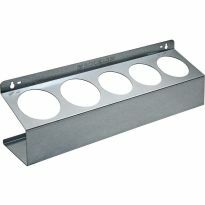 This is a great product for quick and versitile work benches. I bought 2 sets. They went together very well and all hardware is included even some cool accessories. I made one as directed. The storage space is great and the second one I made some modifications very easily for some specific needs. I would suggest having some quick grip clamps handy to make assembly easier and accurate. It was way too tall for me so I returned it. I'm 5'3". There are no notations on the package about how tall it is. It turned out it was something like 36". That's not a workbench; that's a freestanding shelf. ed note: archiving/ sounds like user did not add lower shelving- which would be critical for proper support//////////////////////////////////////////////////////////////Use only for ightweight projects. We made 2 4*8 tables and a smaller one 2*4.5 table. All of the tables went together easily and that is a plus for the product but the larger tables began to twist as the tbles legs began to deflect after about 6 months to the point where they could not be used further. We ended up building the legs out of wood and everything has been fine since. Positive reviews from others. Just wondering it it’s tall enough for a 6’4” person. 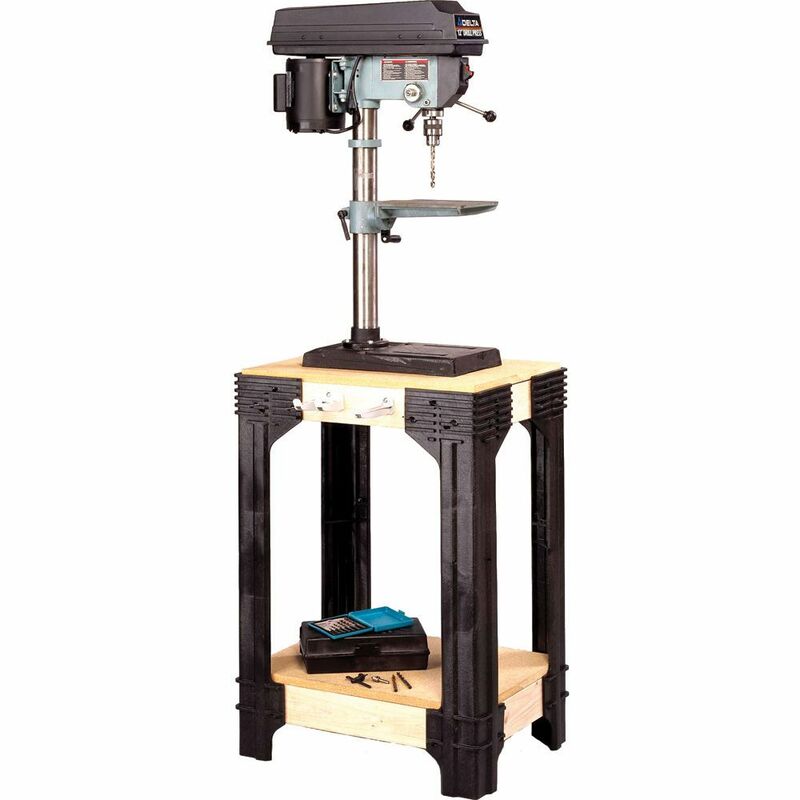 It is the fastest way to create a solid workbench to your own size requirements. I like your design to make my workbench project as simple as possible. To build an easy assembly table. The product has good reviews. 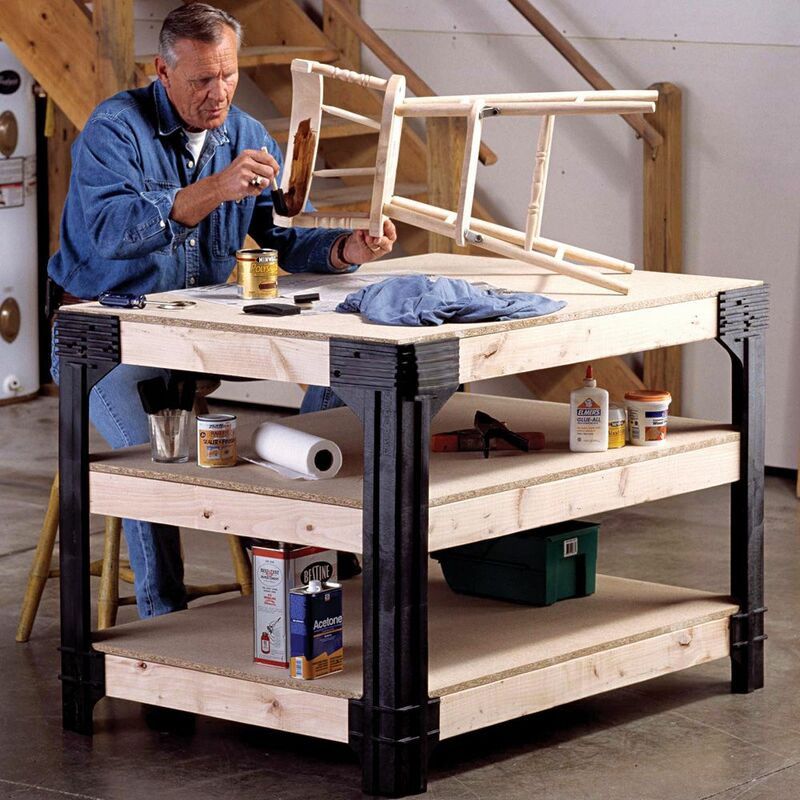 It makes a sturdy and simple workbench construction. The plan download feature prior to prior to purchase sold me. i built 2 benches with these legs, they work great and are easy to put together. I needed two workbench for my new art studio. I choose this item based on online reviews and details at website. I need a sturdy workbench and want to cut down on it's weight. Simple and easy way to make a solid table any size you want. Need for new workbench and the need to set it up. Able to custom build for bench tops I purchased separately. I need another good workspace. I liked it's simple design. An easy way to create a great table for woodworking & the reviews were good. can I put on these legs? BEST ANSWER: I am not sure what this question really means. The legs come with the hardware needed to install the legs onto 2x4 stock lumber. I used a cordless drill to drive the screws into the lumber. I have two workbenches using these legs and they are exactly what I needed. One bench has the two lower shelves for extra storage, one only has the top and bottom slelf. pleased with the end results. The leg set was very simple to assemble and came complete with all necessary hardware,( which was of good quality.) I did find a set of pipe clamps useful in the assembly process. Easy, Just cut your 2x4's to the size you want bench, cut plywood for top and shelf - goes together with screws, very sturdy bench when completed. Yes, with a power drill, saw and no more than average woodworking skills assembly should be easy. Great product and very sturdy result. Yes they are pretty simple. Can swivel casters be mounted to the legs? BEST ANSWER: Not that I could determine. The bottom of the legs is “L” shaped. & there isn’t enough room to mount legs. Would these legs be suitable for a worktable for a wood lathe? BEST ANSWER: John: Since I haven't worked with a wood lathe, it's hard to be specific. I have two tables using these legs. One is 48 by 24 and I use as a wood working bench. I put rockler t-tracks into the top to hold pieces in place. What I like about the table is that it is very solid and stable but also relatively light and can be easily moved. My other table is my reloading station (24x36). I can size and reload rifle and piston casings with a press mounted on the table top. Again very stable but light. Rigidity comes from the 3/4 plywood work surfaces connected to the 2x4 horizontal pieces. I hope this helps. I understand what a wood lathe does, but I'm not familiar with the general size etc. but this table is very sturdy and secure, no wobbling even with kiln shelves and 50 lb boxes of clay stacked upon it. We built it to be 4'x5'. I don't work a lathe, but can say that these legs are sturdy and the table ban be built with heavy dimensioned plywood and lumber. It would certainly work fine for a big mitre saw. Hope that helps. I would say yes, they are very sturdy., made of composite plastic material. Plus two shelves below the top can be added to help with ridigity. I personally would not. I believe the table is not heavy enough. I believe the vibrations would interfere with cutting. Absolutely. I used 3/4" plywood and the bench is super solid and sturdy. Hello. The legs are made of what stuff? BEST ANSWER: I believe they are ABS Plastic. We built 2 benches using 3/4 Plywood and 2x4's - I think you could put a car on it, we will be ordering again to make benches for our special assembly area. Highly recommend. They're made of some type of composite plastic. Very tough. I have made 3 benches so far with these leg kits, they're great. Composite plastic. Nothing special. We purchased three sets to fabricate a custom miter saw bench. I am quite sure they are made of fiberglass. I am very pleased with them. Hard plastic. Very easy to work with and assemble. Is the price per leg or per set of 4? BEST ANSWER: This item includes 4 legs and all assembly hardware. Yes. The product description says foor legs and assembly hardward is part of the kit. yes. price is for a set of 4. Price is for "each" set. Each kit contains 4 legs for a complete table. 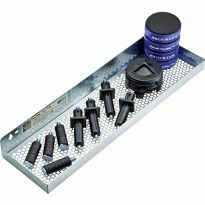 Does everything come with this for a complete work bench? BEST ANSWER: This is just the four legs. You then supply 2 x 4's and whatever work surface you want and configure to meet your needs. The 2 x 4's make up the frame, in whatever dimensions you want. It is a rock solid set up and quite easy to assemble. I have one I set up as an assembly table that is about 35 x 65 with a melamine top with T-tracks and a full lower shelf. It is very strong and solid. The kit contains only the four plastic corner pieces. They are molded to fit 2x4 supports for shelves upon which you can use plywood, OSB, MDF or something else for the shelf material. Adaptable to size and configuration based on your needs. No, it is just the legs (the black items in the picture). I need 31" high legs, these are 36". Do you make them shorter or can they be cut? I would be careful about cutting them, I think it would decrease the stability, Out of the box these are great and we use them in a production area. Hope this helps. We put the workbench together just this week and I love it, it’s perfect for my studio. Unfortunately, I don’t see a way to easily shorten the legs. I would not cut them it will weaken them I believe. Is there a web on the bottom of the legs so that I might attach wheels for ease of movement ? BEST ANSWER: No, there is not a web at the bottom of the legs. However, I found it a simple matter to attach a 4x4 block under the bottom support and attach locking casters to them. The bench can be easily moved and then immobilized by locking the casters. There is a small triangular shaped web which may work. I suggest using the stretchers on the bottom and go inboard a bit. There is a partial web. I cut a wood piece to fit and screwed in place, then attached casters. Works great! 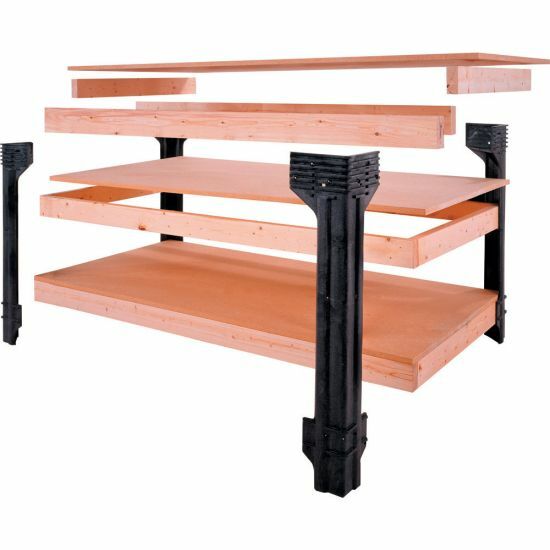 Assuming the legs are pre-drilled for the shelf support 2x4s, what is the vertical distance between the top and middle shelves, or can this distance be varied during assembly? BEST ANSWER: The legs are set up for the top and a bottom shelf. About six inches down from the top there a set of squared holes for one bolt, although the ideal circumstance is for two (actually 4) for each leg. About 11 inches down the setup is for 4 holes. But I'm not sure that all legs are the same. I have two different arrangements. Sorry I just answered information for metal legs. Yes, you can vary the distance, but you can't squeeze too many shelves. Once you have the 2X4 supports in, you will see you have not much space between shelves. I stuck with the holes provided. How do you attach the diagonal support piece (D)? The instructions appear to say no screws? BEST ANSWER: Correct, the diagonal rests on top of the gussets molded into the legs--it's just there to resist "racking", albeit on the horizontal axis. That said, I didn't use it when I used these legs to build a workbench with drawers, I created triangular corner plates out of 1/2" ply and bolted them to the bottom of the 2x4 frame. The result is very solid and...accommodates drawers. Emily, you cut the piece to a friction fit. I did screw through the plywood top into that piece to be sure it was secure. Do you need to have the middle shelf? BEST ANSWER: You don't need to, but I think it helps make it more rigid. For the bottom and middle shelves I router a 1/2" groove in the center of 2x4s and frame the 1/2" thick plywood shelves. I use Kreg's HD screws to connect the outer 2x4 frame before attaching the legs. I just use a 2x4 frame on top and lay a used solid flush door for a bench top. The shelves are very rigid and have a 1.5" lip to prevent stuff from rolling off. I've used the leg kits on 2 workbenches now. One for me and one for a son-in-law. Good stuff. Am considering using leg kit with treated (but safe) exterior lumber for a diy BBQ table to house my kamoda grill. Will legs hold up outside, and can they be painted? BEST ANSWER: I bought this for my shop outside as I made a work bench and putting it together I asked my wife to hold pieces while I attached. It is quit easy to assemble to the length and width you want. It is very durable and if you want to you can paint the legs, but I didn't paint mine as I left the original. I know you will like this. Can castors be attached to the legs? Are the plastic legs UV resistant? BEST ANSWER: As far as I know they don't seem to fade when exposed to the sun. Two of my legs on my bench are exposed to the sun off and on all summer when I have my garage door open, which is pretty much most days during the summer. Hope this helps.